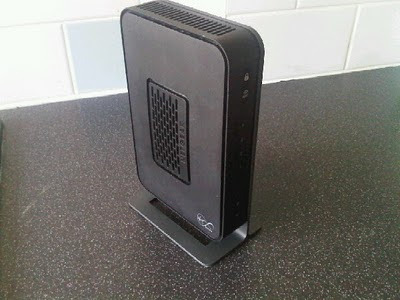 One of the many projects I am working on at the moment is one with the broadband team to overhaul our cable broadband activation process and to rollout a new 'hub' device which merges the cable modem and wireless router into one. In fact I have wangled myself onto the 'hub' trial, and my device that arrived in the post last week looks like this: This is for customers on speeds 20Mb and under, with a further device doing the same function to come for those on 50Mb and above. From reviewing feedback from customers and staff members it came through loud and clear that setting up of a wireless network is difficult and can cause all kinds of issues, so the merging of the two devices into one and having engineers setup the network for customers as well as a much improved activation process will make life easier for one and all. 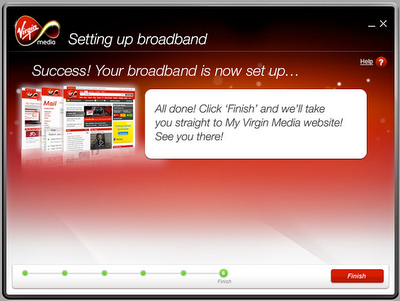 The new activation process also streamlines the setup of Virgin Media e-mail addresses and the installation of other tools such as security and Digital Home Support for those who wish to use them, and we’ve done plenty of testing of the flows with customers also in recent usability testing – getting some brilliant feedback and making a number of tweaks thanks to the usability work. It’s been an enormous amount of work from the project team, but as we’re at the stage of signing off the final activation flows and testing the physical 'hub' devices we’re not far off and customers will start seeing the new process soon … once we’ve got everything ready and everyone who needs to be is trained up. I find it all very exciting really ... And on that note I’m off to test my new hub! My next door neighbour had VM Broadband installed last week, but the Engineer couldn't install the software because the PC was a Netbook with no CD/DVD Drive. Heard him on the phone to his boss outside asking what to do. Don't know if the install Engineers could have this on a USB Flash Drive too? The screens at http://act2.virginmedia.com should cater for this scenario - shout if any probs Graeme. Will the new 'hub' device be standard issue eventually or can a customer still opt for a cable modem and use their own router? Hi - it'll become standard issue as we simplify the equipment for customers and our teams alike. If i have understood correctly eventually the new VM hub will replace all existing customers cable modems. Can you confirm this please Alex? Can customers manually set the hub/router up through an administration page in the normal way through a web browser? Just concerned as http://act2.virginmedia.com seems no good for those who run Linux variant OS's like myself. 1) Can the wireless router part of the hub be disabled? 2) Can i still use my own router inline without VM hubs router conflict with my routers settings and features? I like the features that my router offers that is why i purchased it. I don't really need a hub, just a simple cable modem. It is nice that VM are simplifying the process for it's customers but choice is always a good thing. "If i have understood correctly eventually the new VM hub will replace all existing customers cable modems. Can you confirm this please Alex?" They'll replace the two units for new customers on broadband XL (and lower speeds) but existing customers will also be able to get them if they wish to. More details on this will follow - keep an eye on the virginmedia.com website for updates. "Can customers manually set the hub/router up through an administration page in the normal way through a web browser? Just concerned as http://act2.virginmedia.com seems no good for those who run Linux variant OS's like myself." Yes, the administration page will remain available (via http://192.168.0.1). "1) Can the wireless router part of the hub be disabled?" "2) Can i still use my own router inline without VM hubs router conflict with my routers settings and features?" The Virgin Media hub is designed as a replacement for the modem and the router to keep life easy for both our customers and our own field and technical support teams. Both a Virgin Media hub and a router would run DHCP to dynamically assign IP Addresses and would conflict, so in theory if you disable this in the advanced GUI for one of the devices it should be possible to do this as one would act as a passthrough. This isn't a scenario that we're planning for though and won't be supported - in that our technical support team won't be able to help with any enquiries with regards to it, but in theory it should still work. this is a random question but I've just found your blog and you may be the only person I can ask about this. I am moving into a town house next week and began the process of establishing the utilities today. It turns out that while the rest of the street is broadband enabled, the complex my house is part of isn't and the fastest BB I can get is around 10mb. Because of the nature of the job I do I need a faster connection and assumed given that everyone else I know in the area has 30-50mb service I would be able to too. Is there a way to get a cable installed, or can I use a cable connection from another building potentially and run RJ45 from there in reinforced piping? I have signed off on the property and my ability to work from home is going to be seriously hindered by this situation? Sorry for the delay - been on leave. If you want to drop the cable my street team (cablemystreet@virginmedia.co.uk) an e-mail with some details they'll be able to look into this for you.